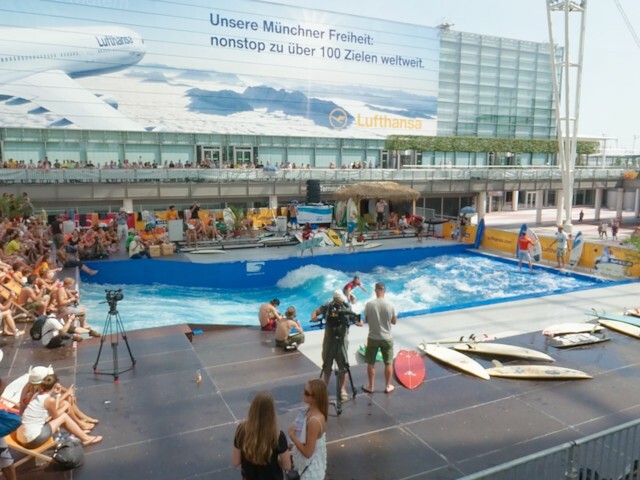 At the Munich airport various amazing sport events take place. This time a standing surf wave has been build between the two terminals. At the first European surf championships on a standing wave the participants were showing their moves on their boards. Find more information about the event (in German) here and here. Find out more about the famous “Eisbachwelle” in the Munich city centre here. Seljalandsfoss is a waterfall in the south of Iceland. It drops 60 meters (approx. 200 feet) over the former coastline. Following a footpath you can get behind the waterfall. This image shows a reprojected image of the Cine-Teatro São João in Palmela. The first projection was stereographic down, the second one droste. Reprojected view of the Heini Klopfer ski jump (at the base). This image shows a reprojected image of the panorama Heini Klopfer ski jump (at the base). The projection is “stereographic down”. This panorama has been made at the beginning of the trail to one of the highest mountains in the Allgäu. It is the Hochvogel, with a height of 2592m. Reprojection of Harpa (which is a concert hall and conference center near the harbour of Reykjavík, Iceland). The Munich Fire Brigade has a special unit to rescue poeple from heights, it operates since 1996. This panorama shows the courtyard of the Tower 185 in Frankfurt/M. It was taken with a pole extended to a height of approx. 3,15 m.